• Location: River Mile 582.8. • River Elevation: 592 Feet. 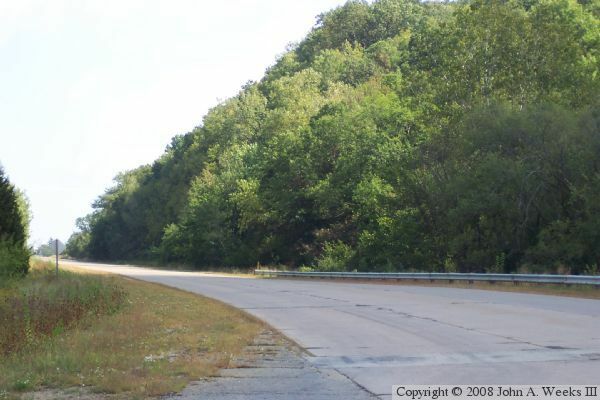 • Highway: Former US-61, US-151. • Bridge Type: Various Steel Truss Sections. • Width: 19 Feet 6 Inches, 2 Lanes. • Navigation Channel Width: 350 Feet (Estimated). • Height Above Water: 70 Feet (Estimated). • Date Built: Opened 1902. 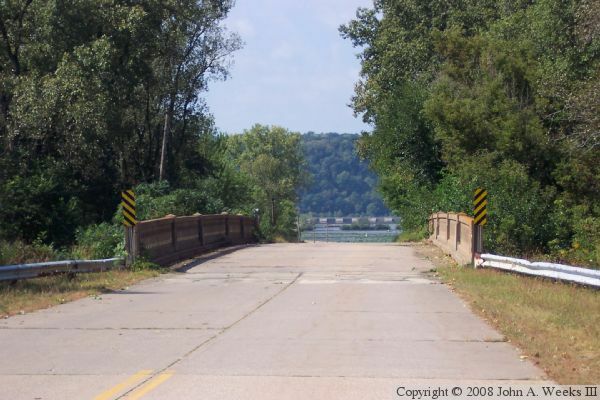 This is the former Eagle Point Bridge on the north side of Dubuque, Iowa. It connects Dubuque with the southwestern corner of Wisconsin. Completed in the early 1900's, this bridge once carried US-61 and US-151 traffic. The US highways were routed away from this bridge in 1969 in favor of the new US-20 bridge a few miles downstream. The Eagle Point bridge continued to connect with Wi-35 until the bridge was closed in the early 1980's when a new US-61 and US-151 bridge opened about a mile downstream. Local citizens lobbied to keep the Eagle Point bridge in place given that it was still structurally sound. The US Army Corps of Engineers considered it to be a navigation hazard, so the bridge was removed in the early 1980's. 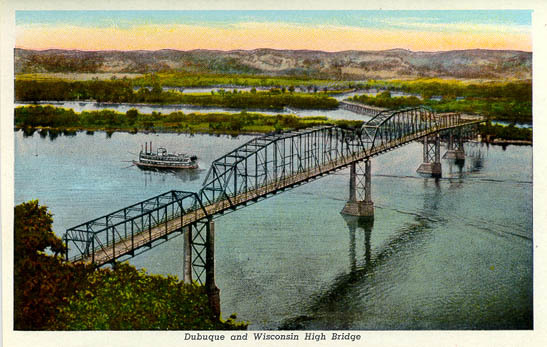 The Eagle Point Bridge was also known as the Dubuque and Wisconsin Bridge. It operated as a toll bridge. The locals called it the Toll Bridge, whereas the US-20 bridge was called the "High Bridge". The bridge itself was somewhat unique in that it had a sharp curve where the trestle on the east connected to the first major span. That can be seen in the postcard scan above. There was another rather sharp turn where the bridge exited on the Iowa side, which is hidden the bluffs in the postcard. The bridge also had a deck truss section, where the structure of the truss was under the roadway. Locals called this the upside-down section. The bridge itself was one of the first 5 vehicle bridges built across the Mississippi River to Iowa, and it was the last of the original 5 to be removed. The bridge actually evolved over time. The first construction was in 1901-1902, there the two large through-truss spans were built over the main channel, with Pratt truss sections at either end. The east side of the bridge featured a 1900 foot long wooden trestle. In 1906 and 1907, a deck truss section was added to the east end, taking the elevated section of the bridge completely across the river main channel. In 1922, the wood trestle was removed, and a steel trestle was built along a new alignment. In 1935 and 1936, the US Army Corps Of Engineers replaced the trestle with three truss sections and a plate girder section. This work was performed as part of the Lock & Dam #11 construction. The final major work was performed in 1946-1947 when the wooden deck was replaced with a steel grid deck. When built, the Eagle Point Bridge had a history of problems with flooding on the Wisconsin side of the crossing. Any high water would swamp the trestle. In fact, shortly after opening, high water washed out a section of trestle, and moved over 300 feet of trestle out of alignment. Each of the construction projects from 1902 to 1937 we to address the flooding issues. The remaining photos below show what is left some twenty years after the removal of this historic structure. 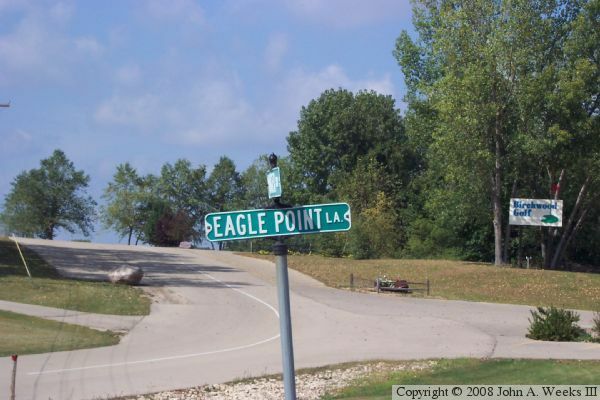 Once a major crossroad of the Midwest sporting two US highway numbers, the road leading up to Eagle Point on the Wisconsin side is now little more than a country lane. 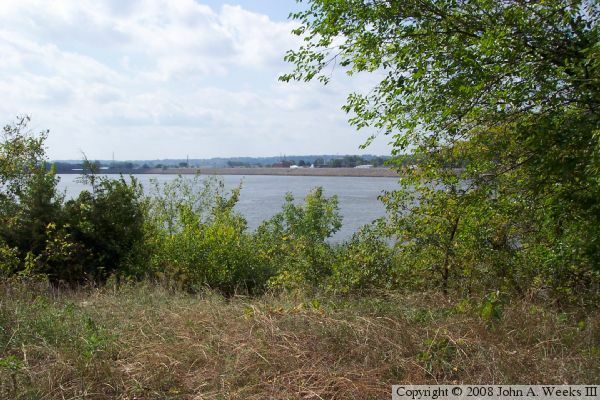 The Mississippi River has cut a deep gorge between two sets of bluffs. 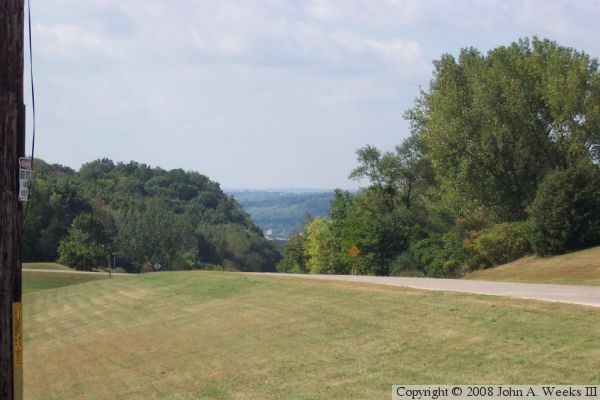 The bluffs average a few hundred feet tall, and sit between 4 and 10 miles apart. The road leading out of river crossing is still in pretty good repair after 20 years of disuse. You can tell it was once a major highway given the guard rail. Notice also the 3rd lane going north. That was for trucks and other slow moving vehicles to climb the grade out of the river valley. An old concrete bridge carries the highway over the railroad tracks that follow the east side of the river. The east side approach was originally a long trestle. 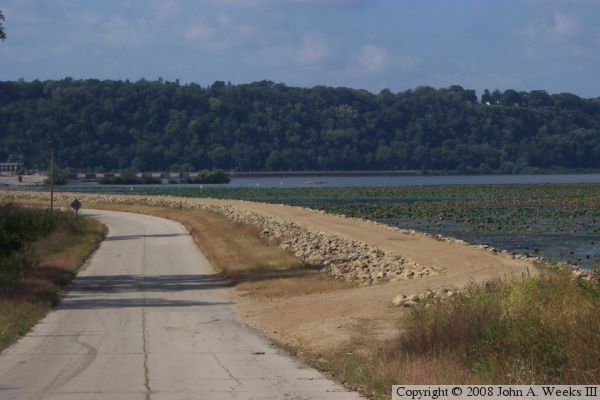 It was replaced with this levee when the lock and dam was built. The levee was raised after the 1991 flood. This steel crossbar marked the maximum height allowed to enter the bridge. The toll booth was just beyond this marker. 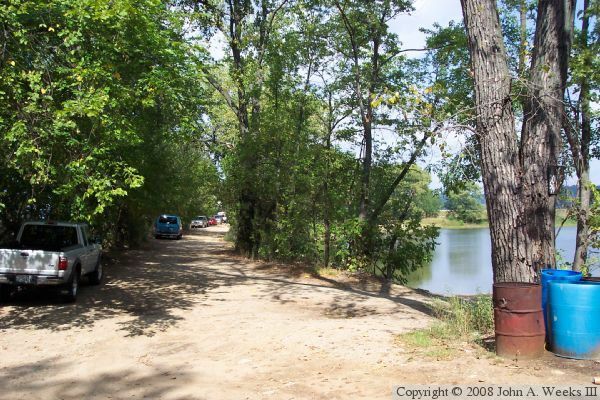 This road continued on for a few hundred feet before it ends at the edge of the river. 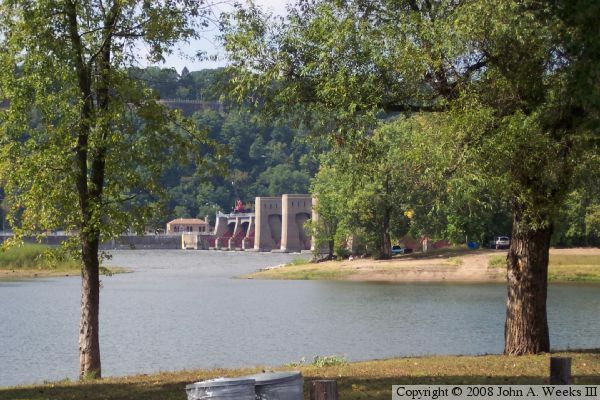 This is a view of the lock and dam system. This lock and dam was constructed after the bridge was put in. A view of the east approach from the edge of the river. 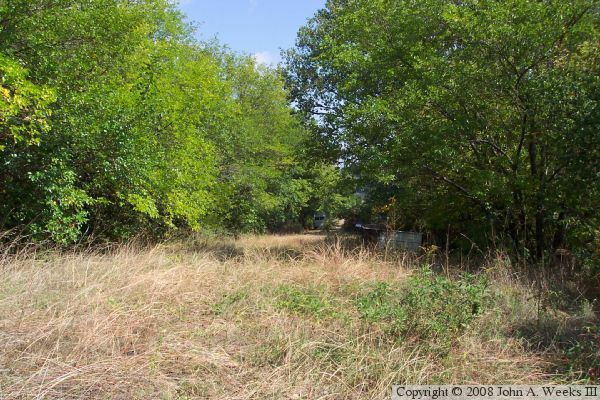 This appears to be private property. 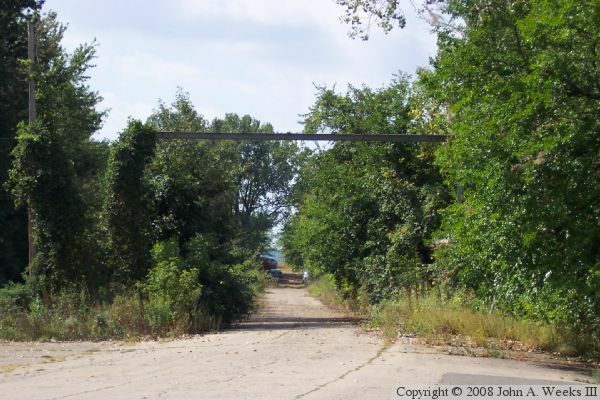 It has some old cars and other junk stored on the site along the old approach road. Looking west across the river from the end of the east approach. There is little left at the river's edge to indicate that a great bridge once stood here. 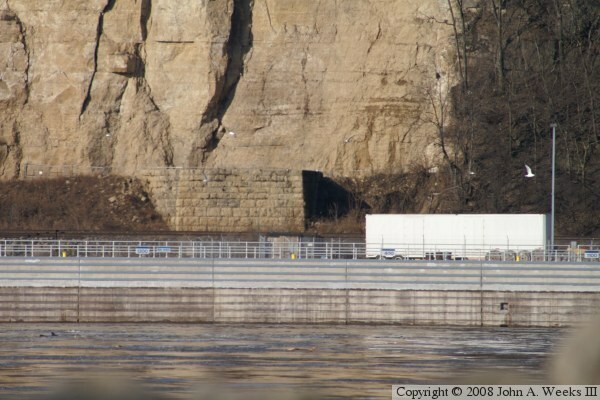 Looking across the river with a telephoto lens shows that the base for the Iowa end pier still exists. Since the lock and dam is off limits to the public, it is hard to find this pier from ground level on the Iowa side. Here is a view up the road to Eagle Point. This is a fairly popular fishing location. 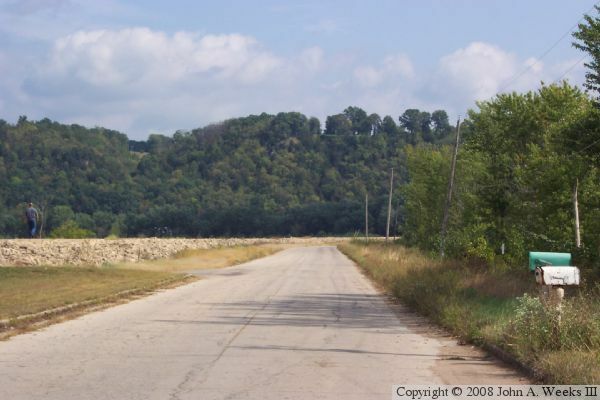 This area produces some very good wild catfish, and the river is far less polluted in this area than downstream of Dubuque. Another shot of the approach road levee, this time, looking outbound to the east to give an idea of how wide this crossing once must have been. The remains of the west end of the bridge. After the bridge was torn down in 1982, a club was built on this property. 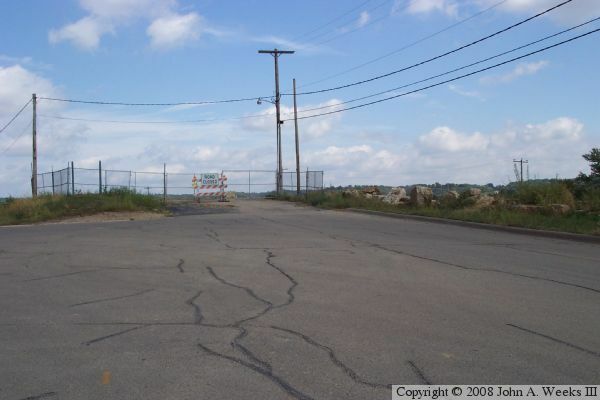 The club has since closed down, and the public once again owns this land. 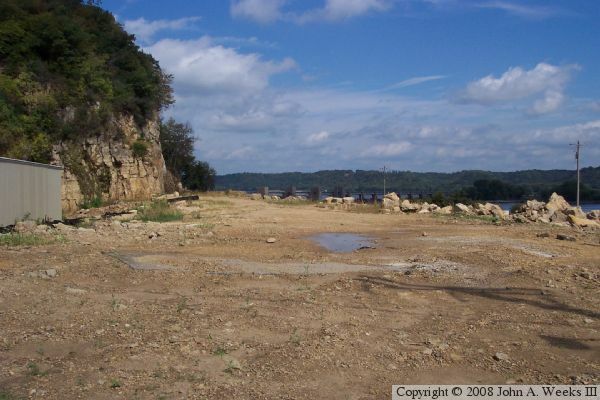 Here are the last remnants of the pavement at the west approach to the bridge.